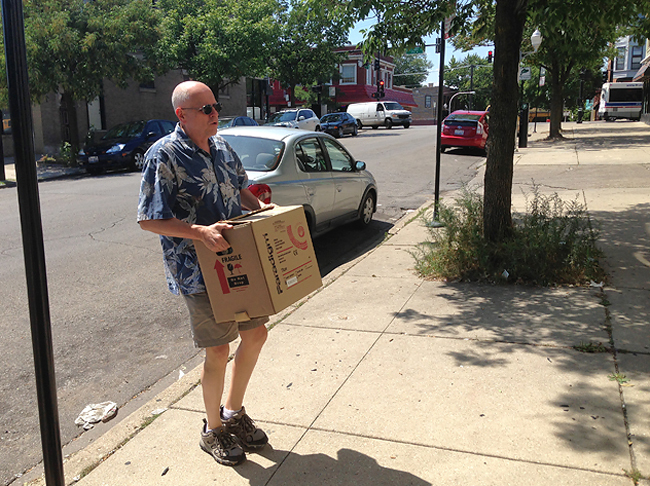 Jeff Shaw, North Shore Country Day School teacher, enters the Ethiopian center with his books donation. 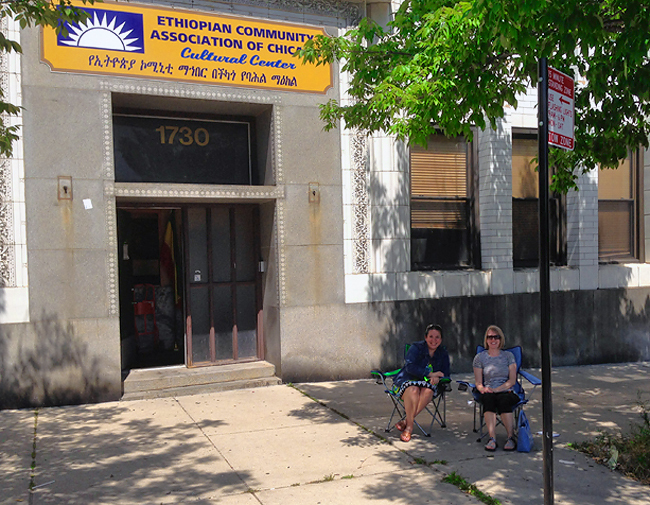 TWELVE BOXES OF BOOKS were collected during the second summer book drive organized by the Chicago Chapter of the Fulbright Association that took place at the Ethiopian Association Community of Chicago on Saturday August 17, 2013 from 9 a.m until 2 p.m. Friend of Fulbright Elizabeth Pereira-Maguet and board member Kari Burnett at the Ethiopian Community Association of Chicago during the book drive. This ongoing initiative’s goal is to collect 5,000 books this year. As reported before, the Chicago Chapter of the Fulbright Association has donated books and educational materials by partnering with the Fulbright offices and associations in different countries. 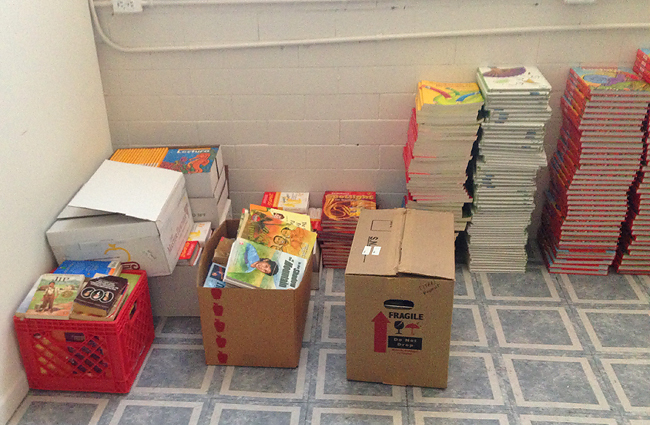 Books have been donated to Panama, Guatemala, Costa Rica, Ecuador, Egypt, Moldova, Ghana and Botswana. Ethiopia and Macedonia are the countries that we will be partnering with in order to donate educational materials next. 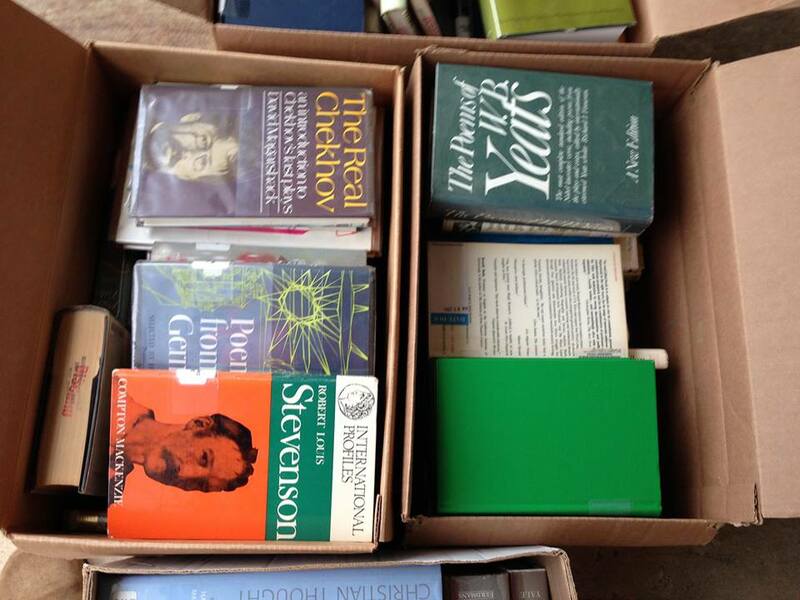 Jeff Shaw, a Fulbrighter who spent one year teaching in Manchester, UK in 2000-2001, donated books in this drive. He is a teacher at North Shore Country Day School in Wilmette. “I had a great experience teaching in England,” he said. Currently he teaches library and technology skills. 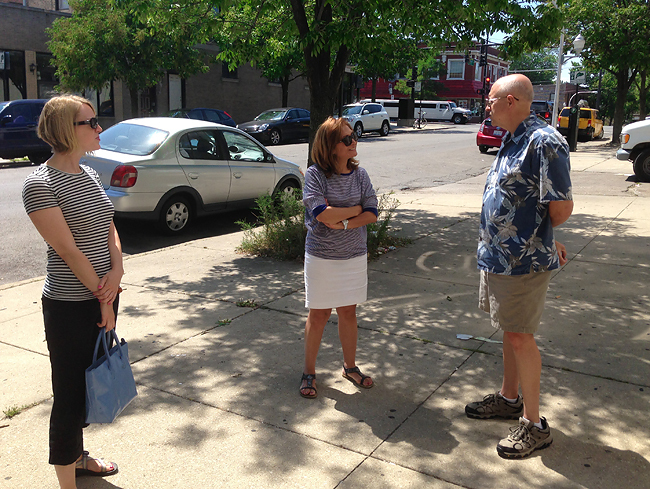 Board members Kari Burnett and Ana Gil-García talking to Fulbrighter Jeff Shaw, who donated books at this drive. DO YOU HAVE GENTLY USED BOOKS that your library is ready to discard? Would you like to see those books in the hands of students from Ethiopia and Macedonia who do not have books at their school? The Chicago Chapter of the Fulbright Association will be holding a book drive! And we need your help. TIME from 9:00 a.m. to 2:00 p.m. This book drive is part of our chapter’s ongoing world initiative “The Fulbright Book Partnership” Program. So far, we have donated over 1,000 books to schools and universities in Panama, Guatemala, Costa Rica, Ecuador, Egypt, Ghana, Moldova and Botswana. 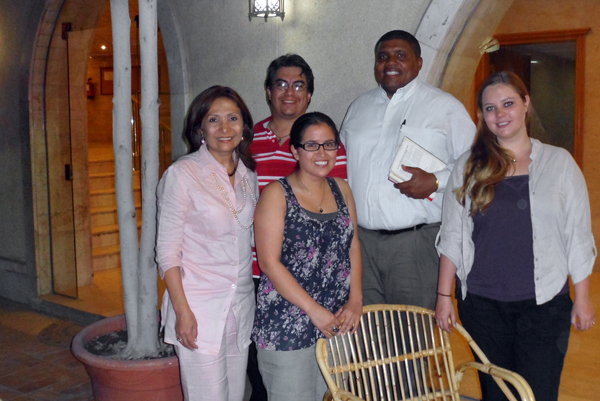 Dr. Gil-García met with Dr. Penn and some of his students during the donation of 45 books for Menoufia university. DR. EVERETTE PENN, A MEMBER of the national board of the Fulbright Association, traveled to Cairo earlier this month with a group of students from Texas, and brought 45 English literature books to donate to Menoufia University, a public higher education institution in Egypt. Dr. Ana Gil-García, leading the Fulbright Chicago Chapter book project, will be delivering Dr. Penn’ s books to Menoufia University along with 110 books she collected from Northeastern Illinois University faculty during her most recent visit to Chicago last week. 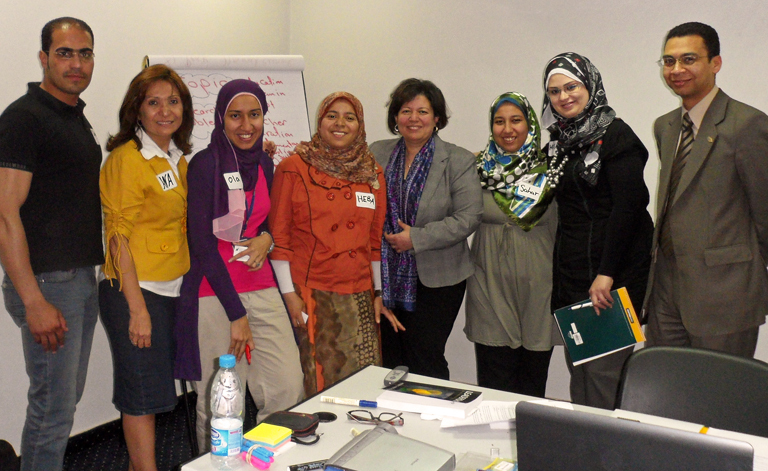 During her year in Egypt, Dr. Ana Gil-García, who is currently teaching at American University in Cairo, has conducted workshops and delivered presentations to several institutions. 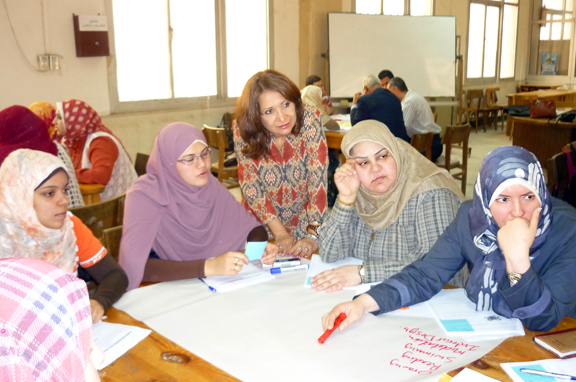 Here, working with a group of fellows at Menoufia University, two hours away from Cairo. AS PART OF OUR ONGOING Book Initiative Donation Program, Dr. Ana Gil-García is currently working in Egypt, more specifically, with Menoufia University. 1. American Literature (Fiction, Drama, Poetry) from 18th C. to present day. 2. British Literature (Fiction, Drama, Poetry) from 16th C. to present day. 3. American and British Literary Criticism to present day. 4. American and British Culture/Civilization to present day. 9. Audio/Visual material related to above fields. Dr. Gil-García will be in Chicago for a week, June 6 -13. If you could donate any new or used book on those areas will be greatly appreciated. Dr. Gil-García will take the books to the Department of English Literature and Language of Menoufia University in Egypt. Please, contact us at fulbrightChicago@gmail.com to schedule a pick up of your donation. 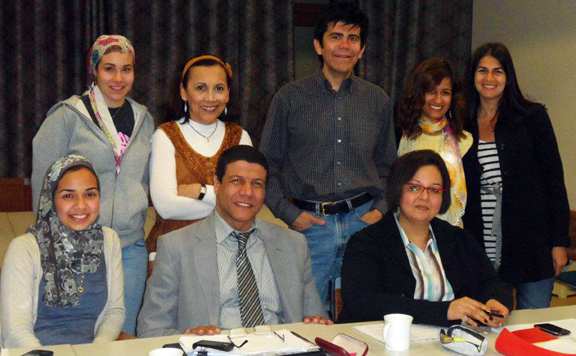 IN MARCH 2012, Elio Leturia, president of the Chicago Chapter of the Fulbright Association visited the Binational Fulbright Commission in Egypt to meet with the leaders of the Fulbright Alumni Circles of Teachers and Humanities and to talk about potential collaborations and support between the chapter and the Egypt Fulbright alumni. As a result of this visit, Dr. Ana Gil-García, board member currently living and teaching in Egypt, delivered a talk titled “The meaning of professional development of English as a Foreign Language teachers” on April 21, 2012 at Menoufia University organized by Dr. Osama Madany, Fulbright Leader of the Humanities Circle, and Chair of the Department of English Language and Literature of the Faculty of Arts. 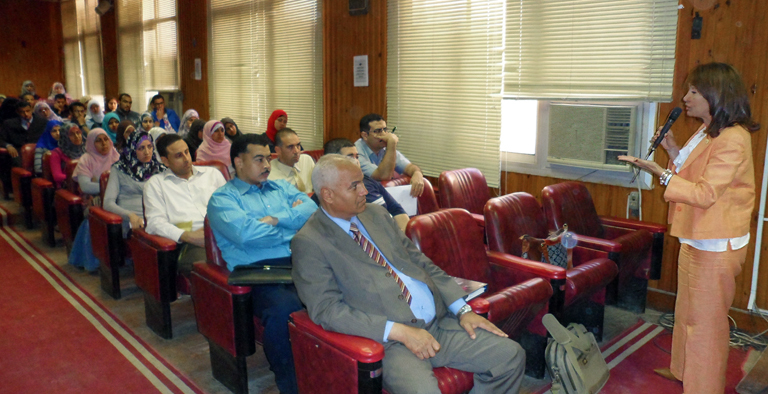 The forum was sponsored by the US American Embassy in Egypt. 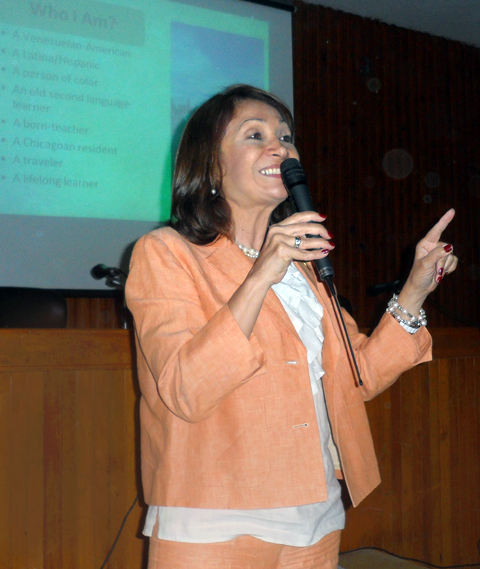 A week later on Saturday April 28, supported by the Binational Fulbright Commission and organized by the Fulbright Alumni Teachers’ Circle, Ana Gi-García delivered an interactive workshop titled “Leadership and Research: The triumphant recipe for school improvement”. Both activities were well attended and the work of the Chicago Chapter was praised and complimented. At the same meeting with Leturia, the fellow Fulbrighter, Dr. Osama Madany presented the library project for the Department of English Language and Literature. Menoufia University, a public institution with an enrollment of 70,000 students, lacks of a library to support the academic instruction of the student body and faculty members. Especially, there is a lack of books, journals, bibliographic references in general related to the field of Teaching English as a Foreign Language, EFL. Through different Chicago universities and faculty, the Chicago Chapter through its Book Initiative Program, agreed on a book drive to collect specialized books to be donated to the Department of English language and Literature of Menoufia University. Dr. Everette Penn, Fulbright National Board member and Chair of the Diversity Task Force, has congratulated the chapter for this unique effort. He has expressed interest in participating in the book drive, and on his next visit to Cairo from June 02-12, 2012, will bring the first donation for the EFL library, co-project undertaken by the Fulbright Alumni Circle of Humanities in Egypt and the Chicago Chapter. Once more, the Fulbright Alumni of the Chicago Chapter engage in experiences that advance international understanding through volunteer service to communities. 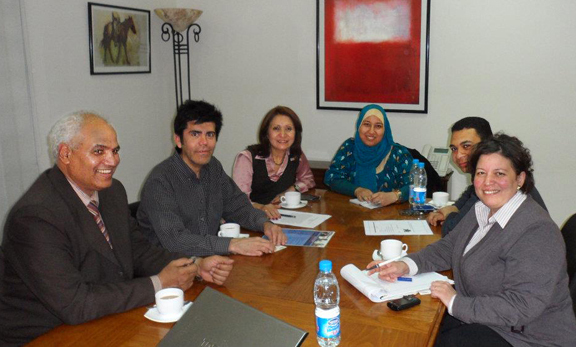 Left to right: Dr. Abdel Moneim, Elio Leturia, Dr. Ana Gil-García, Sahar Ramadan, Ahmed Salama and Safaa M. Abbadi at the Fulbright Commission in Cairo. 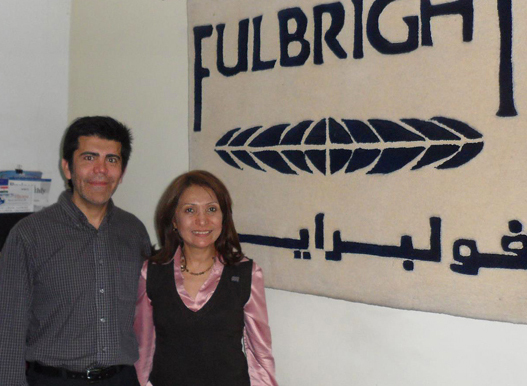 DURING A RECENT VISIT to Cairo, Egypt, Fulbright Association Chicago Chapter President Elio Leturia met with board member Dr. Ana-Gil García, who is currently teaching at The American University in Cairo. They visited the Binational Fulbright Commission, the oldest and largest program in the Arab world, to talk about our Book Donation Initiative to Egyptian universities. They were welcomed by Dr. Bruce Lohof, Executive Director of the Fulbright Commission in Cairo, and then met with Safaa M. Abbadi, manager of Alumni Affairs and Special Projects. Part of the discussion revolved around how to optimize alumni communications. 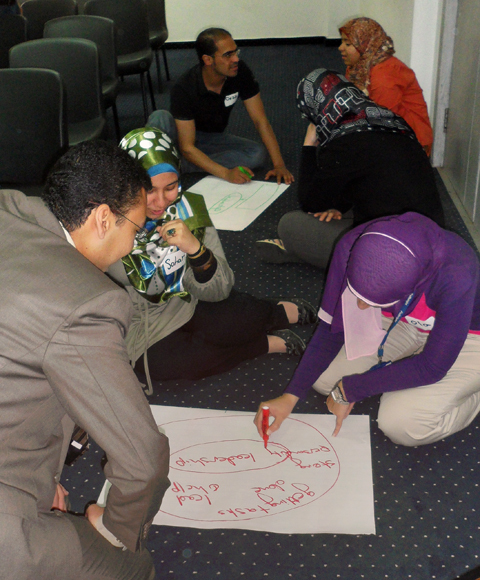 In Egypt, the alumni are organized in what they call “Circles” according to their areas of expertise. At this meeting, that took place on March 26, 2012, participated Ahmed Salama, FLTA alumnus and leader of the Teachers’ Circle for 2012; Sahar Ramadan, FLTA alumna and active member of the Teachers’ Circle and Dr. Abdel Moneim, Professor at the Department of English of Menoufia University. We also had Dr. Ossama Madany, Chairman of the English Language Department at Menoufia University, who joined the discussion, via Skype. The book donation will be, at this time, to Menoufia University. This institution is one of the largest universities in Egypt, which has two campuses: Shibim El Kom, located 47 miles from Cairo and Sadat City, 60 miles from Cairo. During this visit, Dr. Ana Gil-García invited Elio Leturia to present in one of the classes she teaches at the graduate program of International and Comparative Education at The American University in Cairo. In his presentation, Leturia, a native Peruvian who teaches at Columbia College Chicago, did a comparative analysis on the educational systems in Peru and the United States.